Back in October, Marvel held a massive press event where the studio unveiled its entire Phase Three lineup. For fans who have only followed the Marvel Cinematic Universe movies, and not the comics they're based on, it may have been the first time they ever heard of the comic book characters known as the Inhumans. The studio started integrating these characters into Marvel's Agents of S.H.I.E.L.D. last season, but we still have several years left until the Inhumans' big screen debut on July 12, 2019. Today we have a new report from Blastr, which reveals that the Inhumans will start eliminating the X-Men mutants in the comics. Back in June, Marvel announced their All-New, All Different initiative, which will reboot every one of their comic book titles. This reboot will happen after Marvel wraps up its massive Secret Wars story line. Today, Marvel revealed preview panels from Extraordinary X-Men #1, which reveals that the Terrigen Mists, the source of Inhumans' powers, are actually toxic to the mutants of the X-Men franchise. The Terrigen Mists will also sterilize the X-Men mutants, meaning the mutants will eventually go extinct at some point. Blastr speculates that this latest move from Marvel could very well be to strengthen the Inhumans' comic book presence to get fans ready for the Phase Three Inhumans movie on July 12, 2019. Killing off a beloved comic franchise is surely one way to ensure a bigger profile for the Inhumans, but there could be another reason Marvel is killing off the X-Men. The X-Men movie rights have belonged to 20th Century Fox for nearly the past two decades, ever since they started making 2000's X-Men. The franchise is still lucrative for the studio, meaning they probably won't be relinquishing the rights anytime soon. 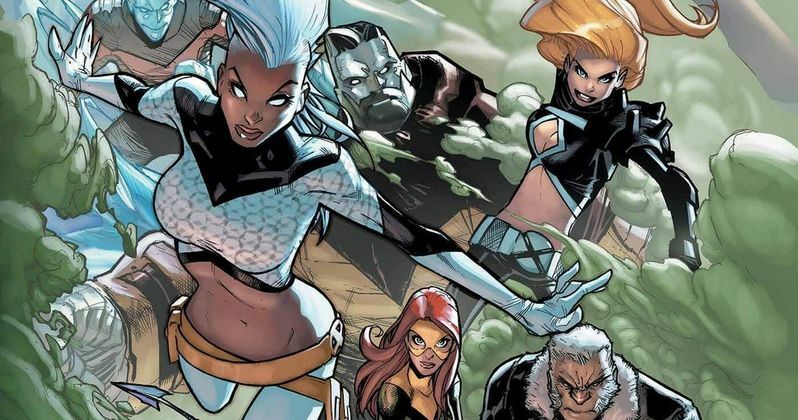 There is speculation that Marvel is killing off the comic book mutants solely because Marvel Studios doesn't own the movie rights, and there are rumors that the mutants could be pushed into a different corner of the Marvel universe, where they don't have to interact with characters that Marvel controls the rights to. Before 20th Century Fox's Fantastic Four hit theaters last month, Marvel Comics announced plans to cancel the Fantastic Four comics, although they claimed it had nothing to do with 20th Century Fox's movie adaptation. Marvel even published a Punisher comic which featured a scene where three Hollywood actors, who look strikingly similar to Miles Teller, Kate Mara and Jamie Bell, were killed in an explosion. While we wait for more details about the X-Men mutants' impending extinction, check out the comic book panels below. Marvel Says Inhumans Movie Is Still Coming, But When?